SYNOPSIS: Athos, Aramis and Porthos are three brilliant and savoy musketeers who were betrayed, resulting in a critical failure on a mission for the French king. A year later, the son of a musketeer, D'Artagnan, comes to Paris to become a soldier like his father, meeting up and aiding the Three Musketeers in a cause to save the king and country from a diabolical plot to overthrow the throne. REVIEW: Alexandre Dumas' novel "Les Trois Mousquertaires" has spawned many iterations and adaptations, both cinematic and literary. 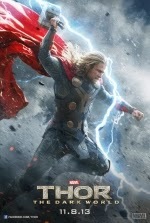 No less than 20 films have been made with one or more of the lead characters attached. Athos, Aramis, Porthos, and D'Artagnan have become part of the lexicon for period swashbuckling and honor-bound heroes, maybe second only to Errol Flynn's Robin Hood, Douglas Fairbanks' Zorro, or Johnny Depp's Jack Sparrow. Director Paul W. S. Anderson (Resident Evil, Event Horizon) takes a stab at a canon of characters that most recently (in 1993) were embodied by Kiefer Sutherland, Charlie Sheen, Oliver Platt, and Chris O'Donnell. With a script from Alex Litvak (Predators) and Andrew Davies (Bridget Jones's Diary), Anderson continues the Musketeer trend of daring sword fights, action, intrigue, and levity. In the late 17th Century, musketeers Athos (Matthew MacFadyen - Robin Hood (2010)), Aramis (Luke Evans - Clash of the Titans (2010)), and Porthos (Ray Stevenson - Punisher: War Zone), in the employ of the French crown and with the help of double agent Milady de Winter (Milla Jovovich - Resident Evil), try to retrieve Da Vinci's plans for a war machine. Double-crossed, the three musketeers, find themselves ousted from the ranks of the corp under the banner of the French crown. A year later, the son of a retired musketeer, D'Artagnan (Logan Lerman - Percy Jackson & the Olympians: The Lightning Thief), travels to Paris to follow in his father's footsteps. Crossing paths with captain Rochefort (Mads Mikkelsen - Clash of the Titans (2010)) of the Cardinal's royal guard, D'Artagnan bumps into the musketeers at their lowest points, and finds himself in the center of a under-handed plot to wrestle control of the french crown away from young King Louis XIII (Freddie Fox). As the musketeers venture forth, the involvement of Milady de Winter, Cardinal Richelieu (Christoph Waltz - Inglourious Basterds), and the English Duke of Buckingham (Orlando Bloom - Lord of the Ring trilogy) comes into question. Swashbuckling, at its heart, is clashing swords, drunken prose, and beautiful damsels - all with tongue-in-cheek levity. This year's The Three Musketeers is no different. Flashes of hardened steel, coupled with flashing smiles of swordsmen who love their work, fill the silver screen. When swords are sheathed, corseted ladies in waiting heave heavily, a French king worries about English fashion and the love of his queen, and a cardinal plots the overthrow of an entire nation. Macfadyen, Evans, and Stevenson step into the musketeer boots as if they were born to play the roles. Athos broods, Aramis repents, and Porthos pines for the finer things. Young gun Lerman' D'Artagnan charms his way through the movie, even as his father's blade slices through the air and his opponents. Jovovich is gorgeous and dangerous. Christoph Waltz plays the Cardinal with superiority and subtlety. Orlando Bloom provides enough venom and contempt to possibly shed his naive Will Turner or his virtuous Legolas. And Freddie Fox plays King Louis XIII of France with aplomb and fancy. 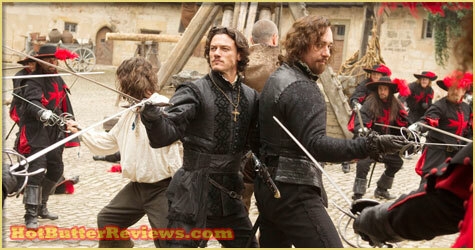 A funny, fast-paced, action-packed popcorn flick, The Three Musketeers will entertain. Some cinema-centric people will see the gadgets of the musketeers and be reminded of Will Smith's Wild, Wild West - but in a good way. Others will watch the cathedral top sword fight and think about Brandon Lee and The Crow. If you like swashbuckling and swordplay, The Three Musketeers will fit the bill. All in all, this film is all for one, and one for all! I wanted big and ludicrous and silly, with swords and airships. That's pretty much what I got. Still, I'm not surprised one bit that just about everybody hates this film. Good review.